The steel industry got a huge boost last month, but that’s built more on hope than reality right now. Companies across the steel industry saw their shares shoot higher in November. The moves ranged from a huge 75% gain at AK Steel (NYSE:AKS) to a more modest advance of "just" 12% for ArcelorMittal (NYSE:MT). But the interesting thing is that the month really broke down into two different parts. An AK Steel employee at work. Image source: AK Steel. For example, United States Steel (NYSE:X) shot 67% higher in November. 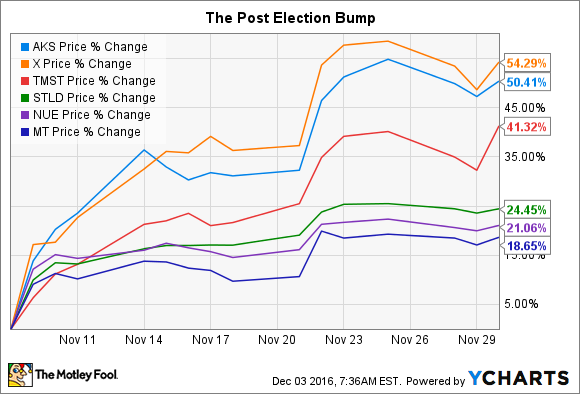 But the vast majority of that gain came between Nov. 9 and Nov. 30, a period in which the stock was up 50%. In the first eight days of the month the stock rose around 8%. That was the same even at the "lower" end of the performance picture. Nucor (NYSE:NUE) and Steel Dynamics (NASDAQ:STLD) were up around 4% or 5% through the first eight days of last month but rose over 20% each between the 9th and 30th. Note the one date I didn't specify by name -- Nov. 8. That was the day of the U.S. presidential election. On that day the United States selected Donald Trump to be the next leader of the country. Although there were obviously unique things going on at each of the five steel companies mentioned, the bigger-picture story was clearly what drove this group last month. And that was all about Trump's tough talk on trade, with a notable highlight for the steel industry. Take this quote from before the election: "We are going to put American-produced steel back into the backbone of our country." Those types of comments were backed up with trade threats that strongly hinted Trump would use his position as president to protect companies such as AK Steel and United States Steel from the flood of cheap imports coming into the country over the past few years. To be honest, however, anything Trump might do, now that he is the president-elect, would be built off the trade wins the United States has already achieved in the steel space. Over the past year or so, China, the largest producer of steel in the world and a major exporter of the product, has specifically been hit with a number of sizable tariffs. As a result, foreign imports in some key areas have already begun to fall; helping to push up steel prices in the U.S. market and improve the fortunes of the industry's key players. So the real juice behind the post-election steel rally is the expectation that Trump's policies will, indeed, be good for the U.S. steel industry. That includes not only his position on trade, but also his promises to improve domestic infrastructure -- something that would increase demand for steel. Clearly, investors are excited about the prospects for steel. Higher prices would have different impacts, though. For example, AK Steel and U.S. Steel both make heavy use of blast furnaces. These tend to be less flexible than the electric arc furnaces Nucor and Steel Dynamics favor. It's one reason Nucor and Steel Dynamics have fared better financially through the steel industry's long downturn. However, blast furnaces can produce fairly low-cost steel when run at high capacity -- something that simply hasn't been happening of late. And if steel prices are pushed higher, too, there's a real reason to think that the pain at AK Steel and U.S. Steel could be nearing an end -- hence the relatively large advance at this duo. The more subdued advance at other competitors reflected their stronger industry positions going into the election juxtaposed against the potential for industry improvement under a President Trump. As an investor, however, you need to take all of this with a grain of salt. While a president can have a large impact on an industry, changes take time. For example, any infrastructure spending President-elect Trump wants would have to work its way through the normal, and often contentious, government process before getting put into effect. In other words, it could take a while before material spending on infrastructure takes place. And shifting the U.S. trade stance isn't something that takes place in a vacuum, either. It could be harder for Trump to make changes than he hopes, and those changes could have unintended consequences that turn out to have negative repercussions. This isn't to suggest that he won't live up to his promises, though politicians from all parties are known for falling short of their campaign speech rhetoric. It's just that anything he hopes to achieve will take time even in the best-case scenario, and at this point there's no way to really tell what the outcome will be. So the massive moves seen in steel in such a short period of time are based more on hope than on reality at this point. Tread carefully.